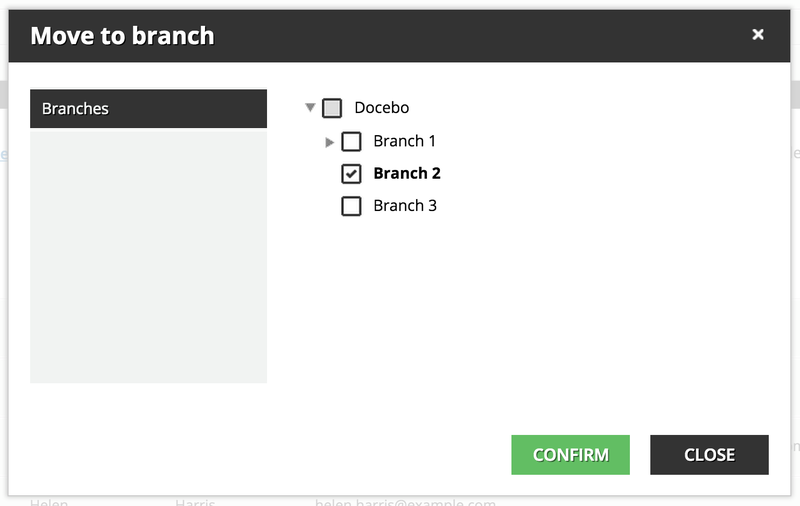 Your Docebo LMS allows you to organize users into folders and subfolders, which means you can structure your learners in a way that is similar to your company’s organizational chart. Folder names can always be edited in your platform, and subfolders can be created by selecting a new branch, then inserting a folder within that branch. Furthermore, individual folders can be dragged and dropped inside your branches, so you can order them as desired. 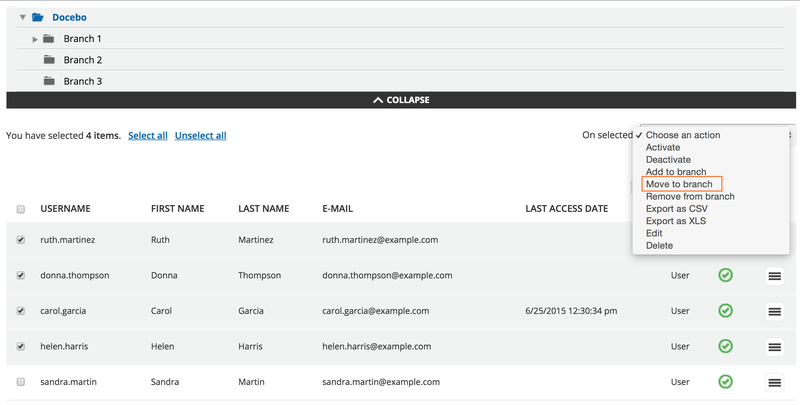 In order to create an organization chart, log into your platform as the Superadmin. Then, access the Admin Menu by scrolling your mouse over the gears icon in the left sidebar. In the Admin Menu, find the E-Learning section, then press the Users item. On the main Users Management page, you can organize your users into different folders, in a unique order or hierarchically. Newly created users will always be places in your root folder (Docebo), but you can always create new folders and organize them within the root folder (without limits). Every user that you create can be associated to a node. This is essential to the organization and creation of different folders per office, agency, division, unit, country, etc. To create a new node, select the New Branch button from the action bar at the top of the Users Management page. 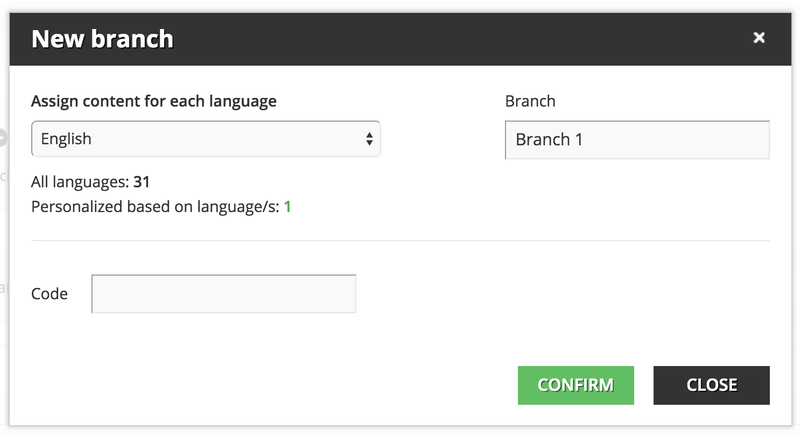 In the pop up box, assign a language to the branch from the corresponding dropdown menu, then give a title and a code to the branch in the text boxes. Please note that if the organization chart folder has been set in a specific language that is not the default language on the platform, the folder name is still shown in the platform’s default language. Remember, the code you assign will be the same for each language. The code is an alphanumeric value and is not a required field. Then, pressConfirm. Folders and subfolders can be created by selecting a new branch, then inserting a folder within the selected branch. To create a subfolder within a main folder, simply select the main folder and then select New Branch. Then, repeat the same process as outlined above (assign a language, then provide a name and code). If you want to view subfolders, select the related icon to open the folder, as shown in the image below. To manage a folder, press the arrow icon that will appear on the far right of the folder’s row when you scroll your mouse over the row. From the dropdown menu, you can assign users to the folder, edit the branding template (for those using Docebo’s Extended Enterprise app), edit languages and names, set additional fields visibility, or delete the folder. Let’s take a look at each function in the dropdown menu. You can add users to a branch by flagging them from the user list at the bottom of the User Management page, then choosing the Add to branch option from the dropdown menu on the right side of the page above the user list, as shown in the picture below. Then, in the pop up box, select the branch(es) in which you would like to add the users and press Confirm. You can move users from one branch to another by selecting them from the user list on the bottom of the main User Management page, then choosing the Move to Branchoption from the dropdown menu on the right side of the page, as shown in the picture below. In the pop up box, select the branch in which you would like to move the users, then press Confirm. You can remove users from a branch by selecting them from the user list on the main User Management page, then choosing the Remove from Branch option from the dropdown menu on the right side of the page, as shown in the picture below. Select the checkbox, then press Confirm. The removed users are then redirected and replaced to the root folder again.